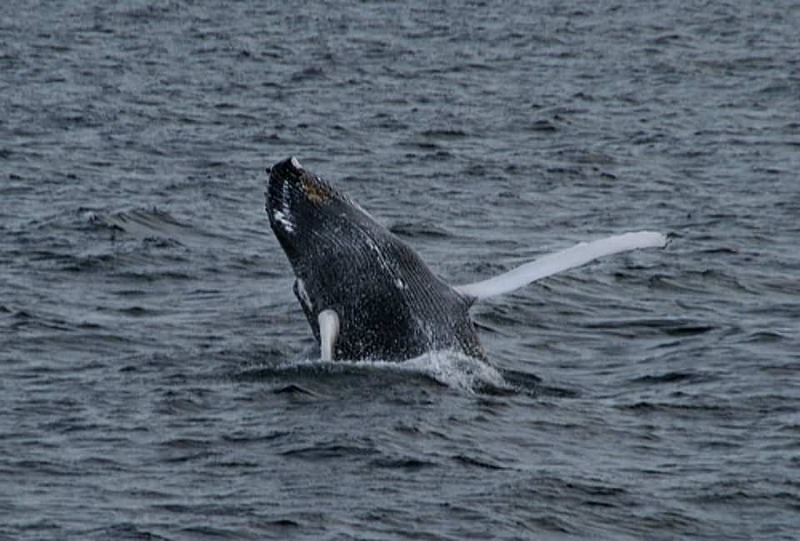 1.Whale Watching: Interestingly a lot of revenue generated through Iceland tourism is through whale watching. No matter where you depart from, the tours offer a rare and stunning opportunity to observe whales in their natural environment alongside white-beaked dolphins, harbor porpoises, seals, basking sharks, and various seabirds—including puffins, Gannets, gulls, Arctic Terns and others—this depends on the season. 2.Journey to the center of the earth: You can descend inside the remains of Iceland’s dormant Thrihnukagigur volcano. You will need to hike for around 50 minutes over cooled Lava fields to reach the site and then your guide will take you inside the volcano in an open elevator down inside Thrihnukagigur’s magma chamber. You can walk around the subterranean arena and learn about the volcano’s last eruption, 4,000 years ago. The Langjokull glacier is the second largest glacier in Iceland. 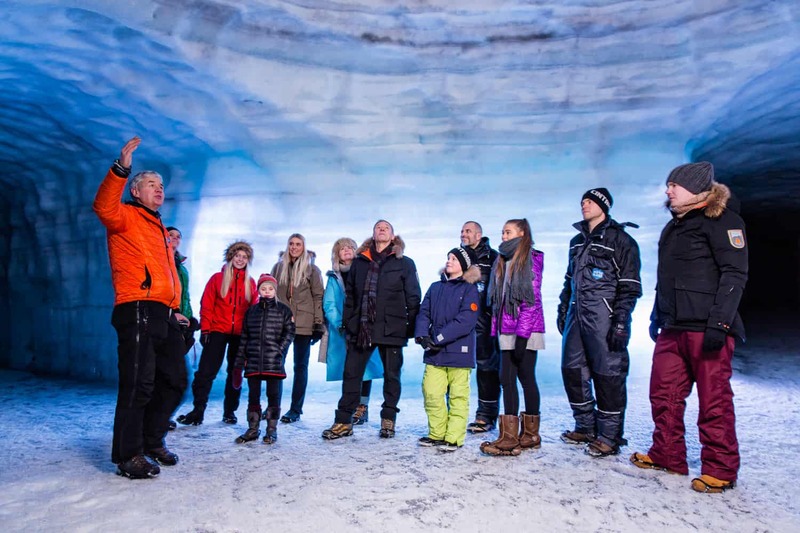 An experienced guide takes you on a tour for about an hour into and through the glacier tunnels. The horseshoe shaped tunnels are about 500 meters long and wide enough not to feel claustrophobic at any time. The walk is a fairly easy one, but better to have your hiking boots on since is it a glacier! After, the guide walks you through the tunnels with stops here and there on the way, telling you about the history of the glacier and explaining the different kinds of ice. There are five man-made chambers in the tunnels lit up with LED lights and the ice shows it’s many different blue colors. 4.Northern Lights: Winter nights are spectacular from September to March, solar activity creates frissons of color that can be seen in the sky on clear nights. Sometimes you can see the Northern lights in Iceland as early as August, as soon as the night skies get dark enough and weather conditions are favourable. Since northern light’s occurrence is unpredictable if you head to Iceland to watch the lights, it is best to keep a few days in hand. 5.Natural Geysers: National Park in Iceland is a geothermally active area with many natural hot springs, some of them erupting. The largest two largest erupting geysers are Strokkur, which erupts to a height of 20 meters roughly every 15 minutes, and Geysir, from whom all geysers take their name, which erupts to a height of 70 meters, but only sporadically. It just mesmerises you. This mixture of geothermal activity, ice, and fire, means that there are numerous hot springs and geysers all over the country. Some of the hot springs are boiling hot but other ones have the perfect temperature to bathe in. These hot springs are equally popular with travellers and locals alike. The Blue Lagoon is surrounded by a lava field with rocks coated in moss, which contrast breathtakingly with the milky light blue waters of the geothermal pool. 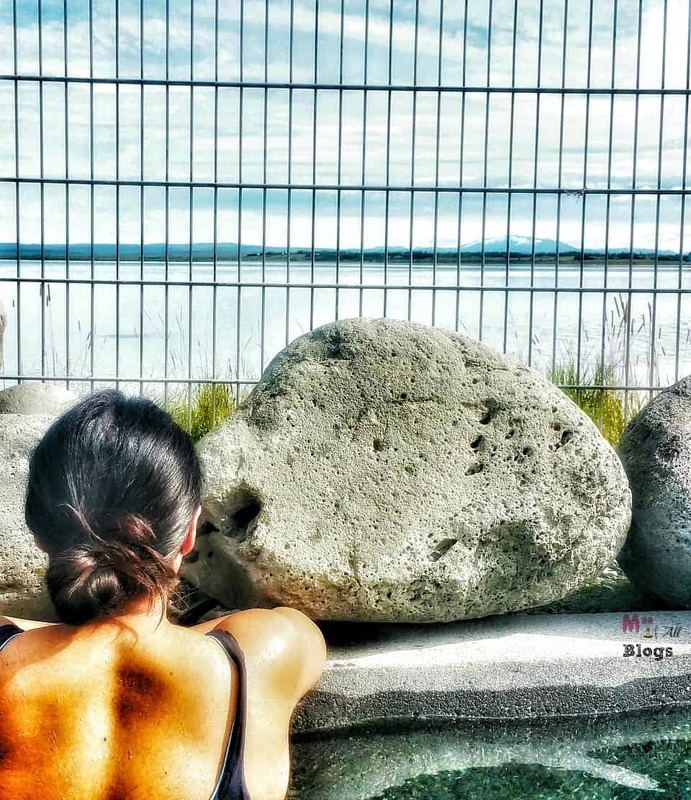 Laugarvatn Fontana is located right next to a lake, where you can look out onto the beach and lake as you sit in the hot tubs and pools. I headed to the Fontana Spa after my hike and combined it with the Golden circle tour and it was such a treat to my aching body and sore toes. 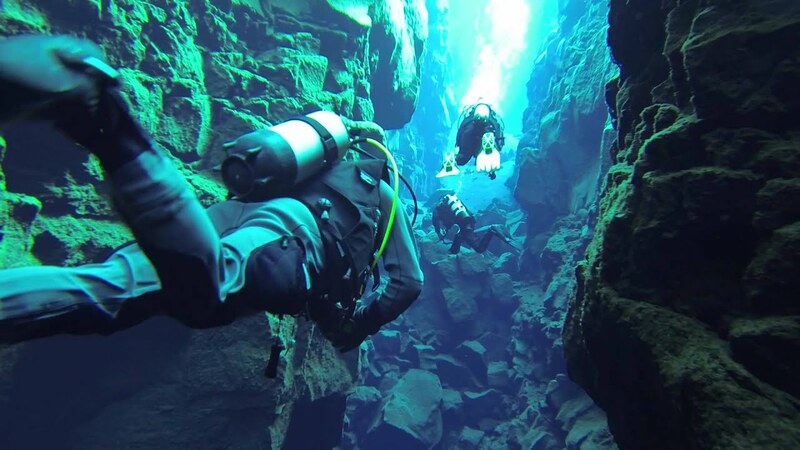 The Silfra fissure is actually a crack between the North American and Eurasian continents, meaning that you dive or snorkel right where the continental plates meet and drift apart about 2cm per year. Here the underwater visibility is over 100 meters, which creates an underwater experience like no other. The amazing clarity of the water is due to two reasons it is cold (2°C – 4°C year round ) as it is glacial water from the nearby Langjökull and this water is filtered through porous underground lava for 30-100 years until it reaches the north end of Thingvellir lake, seeping out from underground wells. 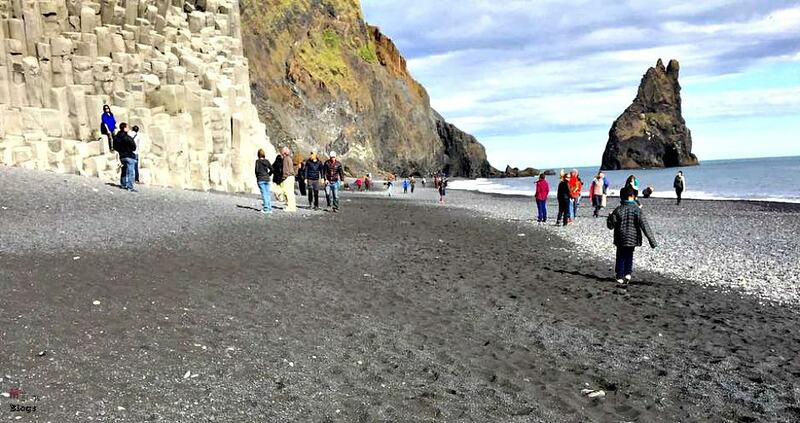 8.The black sand beach: In 1991, the US journal Islands Magazine counted this beach as one of the ten most beautiful beaches on Earth. IVik is Iceland’s southernmost village and faces the open Atlantic Ocean, framed by a long black volcanic sand beach. Nearby the spindly Reynisdrangar rock formations stick out of the sea, and as the legend goes, were formed when trolls attempted to drag three ships ashore. 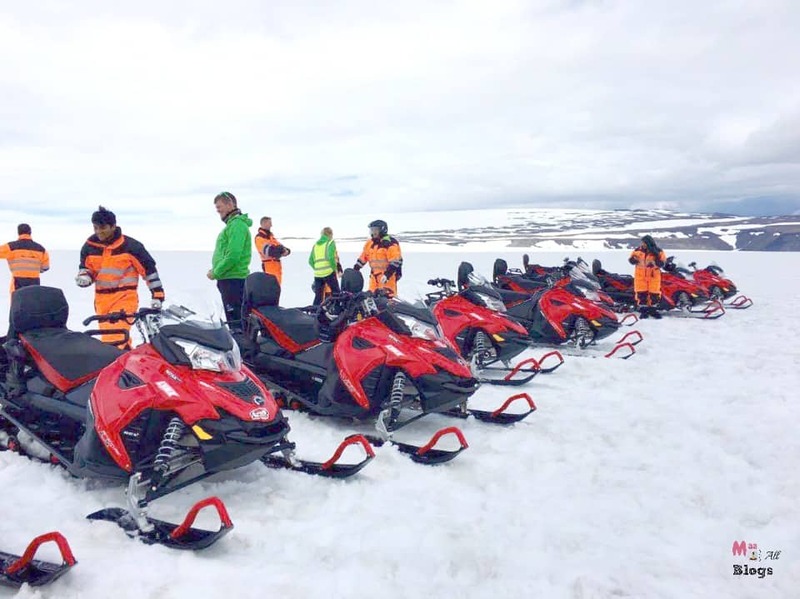 We went in these monster trucks to a base camp where everyone who was doing the snowmobiling. We were given the costumes suitable for the weather and then we rode over the glacier. 10.Jökulsárlón means glacial river lagoon is a large glacial lake in southeast Iceland, on the edge of Vatnajökull National Park. Situated at the head of the Breiðamerkurjökull glacier, it developed into a lake after the glacier. 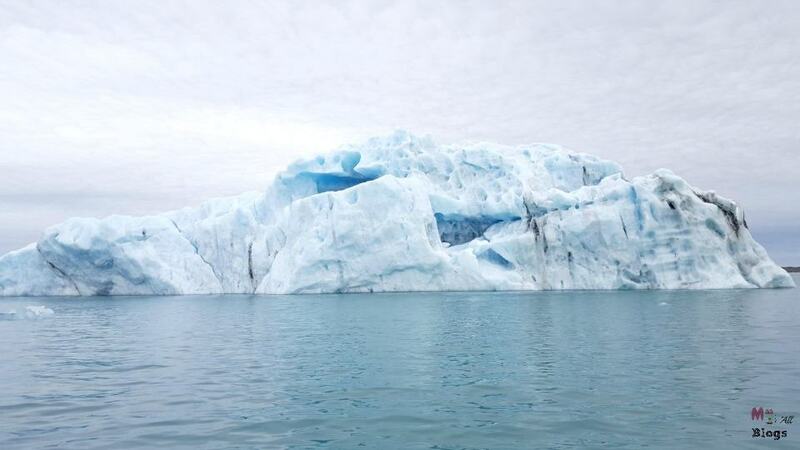 Here you can sail among the huge icebergs in the picturesque scenery of Jökulsárlón. On the boat you get to taste the 1000-year-old ice and if you are lucky you might even see some seals. And if you think these are not active enough options for you, you can go for day hikes, two-day hikes or more like me. Will be sharing my hiking experience soon in a separate blog. A big question did I actually do all of these activities? Nope! With my 5-day of hiking and 2 days of travelling to just reach Iceland, I would need at least another week here to finish this list, so these are still things that I want to catch up on. Maybe another trip to Iceland is pending. Game of Thrones Fan or not I think now you have plenty of reasons to head there. Wow..you have done both too! I have to read your Iceland post now. I remember reading your Northern lights post. Oooo I am so excited reading this post. Visiting Iceland in Jan 2017, and this is a perfect post to keep in mind the highlights this beautiful place has to offer. Awesome captures! Bookmarking this for my visit! Wow..I actually want to go back. There is so much I want to do still. Would you believe that I couldn’t do even 50 % of the list. You are sure to love it. Btw do something for your site loading. It is terribly slow.. Thanks Stephen for letting me know about site loading and yes Iceland is worth it :)! Wonderful post, I would love to ride the snowbike and experience the glacier tunnel if I ever go there. Thanks for sharing. You know I have always had Greenland and the Scandinavia in my mind as places I need to visit at least once. And seeing the lovely pics of Iceland you have put forth, I am all the more keen to combine the Scandinavia or Greenland trip with Iceland :D.
Iceland is really recommended but honestly to combine the three you have to go on a really long vacation. Though doing it along with Greenland makes a lot of sense. I want to go to Iceland and stay in one of those ice hotel rooms like the James Bond Movie – Die Another Day! Ice hotels is a cool idea but I am not sure Iceland has them. Yes, it was Deepa. Still trying to get over it’s effects :)! Most of my trip was hiking, have to still pen that bit down. Oh wow!! You have given me some serious wanderlust… yet again!! Iceland is in my list for long, specially because of northern lights. But there are so many other things to do as well. Thanks for sharing. Thanks Raj. I was nostalgic myself while penning this down and I haven’t even managed 50% of the list. I want to go back now :). Will refer your post again before heading to Iceland. I’m trying to convince my husband to go to Iceland, but he’s hesitant. I think the snowmobiles will make him want to go! 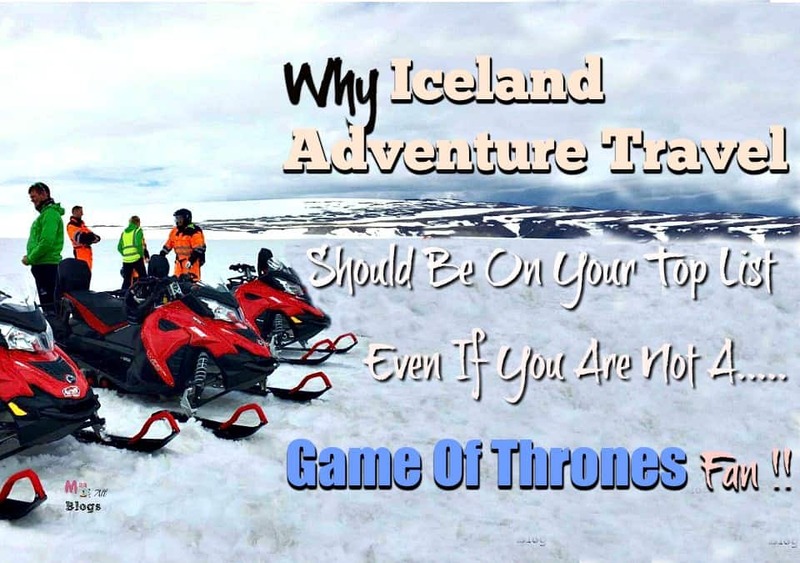 Thanks for sharing your experience, I had no idea there was so much fun stuff in Iceland! Northern lights are not going to be seen after this year for almost a decade. So if you are chasing them you must plan for this year. Such a mesmerising experience . It’s a beautiful place and so much to do and Game Of Thrones just adds to it’s charm ;)! My bank balance at the moment sends me to depression,but nevertheless, I am going to start saving up to visit the gorgeous place. Even if it means saving up for a year, would totally recommend it. Thanks Richa, the place is so awesome that I did not have to work very hard to convince people :). Thought of Iceland as ice and nothing else, but realize now that it’s much more than that. Thank you for the post. Actually, Iceland is quite green and it’s Greenland that is mostly ice. There is a very interesting story behind it. You should google it :). This is so cool! I’ve never been to Iceland, but your post makes me want to go. I never thought you could dive there either. Was the water super cold? It must have been amazing to see those whales as well. Hey Betha, the water is supposed to be below zero and it’s super cold but they give you dry diving suits and that makes it more manageable. However, I did not do this. A lot of stuff on this list is still pending for me. I’ve been seriously considering a trip to Iceland recently. I think it’s the perfect place for both relaxation and adventure. There’s not a single thing you have listed here that I wouldn’t DIE to do, so thank you so much for listing them all perfectly! Thanks Suzannah, glad to bump into a Travelophile like me :)! I’ve always wanted to visit the Scandinavian countries and Iceland would be a dream destination. I would definitely love to go observe the whales. Descending into the volcano would be the ultimate adventure! Thank you for these tips. Thanks Sia, there is just so much to do there. Iceland is quite a hot spot at the moment and after reading your post I can see why. The closest I’ve been is to Norway and I’m definitely going to Iceland sometime soon. Looks fabulous. The best thing is, it is not only the stunning landscapes but also super cool people ;). Oh, how much I love Iceland! Just checked your post too, it is quite a pretty country. Iceland is quite amazing. Even I had not expected it to be so pretty. That’s exactly how I feel about Iceland. It really is different from other travel destinations :). I only wish I had thought of a good photoshoot opportunity when I went there. Some bloggers have done an incredible job with it.